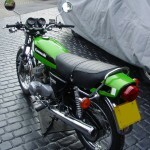 Restored 1979 Kawasaki KH250 Motorcycle. 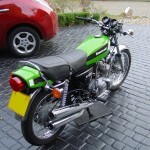 This lovely little Kawasaki was fully restored by its owner. The frame, swing arm and stands were powder coated. The fork stanchions were hard-chromed and new seals were fitted. The original Takasago wheel rims were re-chromed and laced with NOS Kawasaki spokes. 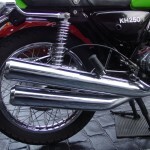 The original exhausts were re-chromed. The carburettors were ultrasonically cleaned and rebuilt. A new old stock seat base was sourced and fitted with new foam and cover. 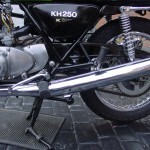 A re-chromed kickstart was fitted. The front brake was fitted with a new piston, seals, brake lines and pads. An original headlight was sourced and fitted. New carburettor rubbers and mounts were fitted. Genuine NOS mirrors were fitted. The original switchgear was refurbished. A new genuine fusebox was fitted. A lovely restored Kawasaki KH250 B4 Motorcycle. 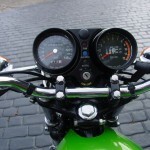 Kawasaki KH250 B4 – 1979 For Sale or Wanted? 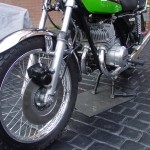 If you're looking for the perfect Kawasaki KH250 B4 – 1979 for sale then take a look at the hundreds of restored classic motorcycles listed on our extensive Motorcycles For Sale pages. 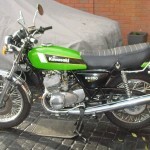 We regularly feature very nice restored Kawasaki KH250 B4 – 1979 bikes for sale. 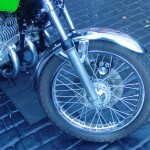 Spares and Parts for your Kawasaki KH250 B4 – 1979? 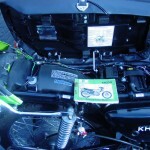 Workshop Manual for your Kawasaki KH250 B4 – 1979?